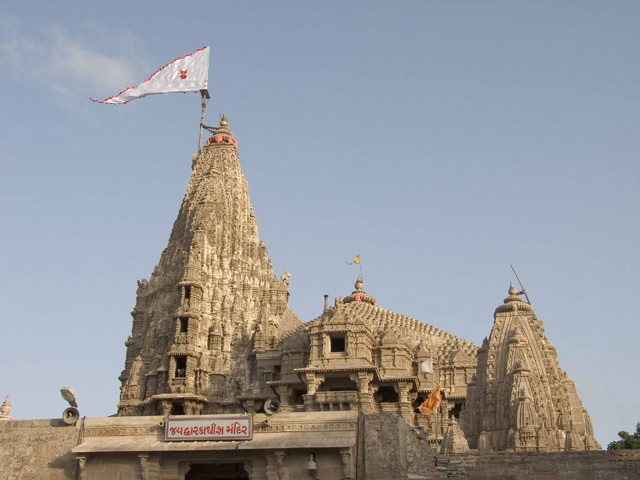 Located in the Okhamandal Peninsula on the bank of the Gomti River is a holy city called Dwarka. This city is situated in the state of Gujarat in the Devbhoomi Dwarka district. It is also supposed to have been Gujarat’s first capital. Additionally, it is also an important Hindu pilgrimage center that features popular temples such as Rukmini Devi Temple, Bet Dwarka etc. Important travel information about this pious city is as follows. The best time to visit this city is in between November to February as a result of the climate being pleasant with, the temperature during this period ranging from a maximum of 23 degrees Celsius to a minimum of 9 degrees Celsius. b. How to reach Dwarka? This city possesses its own railway station. The Dwarka Railway Station is well connected to major cities in the country. There are a number of bus services that connects Dwarka to many of the major cities in the country. The nearest airport to Dwarka is located in Jamnagar. The Jamnagar Airport is well connected to major cities and towns in the country. This holy city is closely linked to many myths surrounding Lord Krishna. One such myth states that it was only after Lord Krishna killed his uncle Kansa in Mathura that he decided to settle down in this city. A legend also claims that Lord Krishna apparently claimed 12 yojanas i.e. 96 square kilometers of land from the sea to create this city. This also was the city which Lord Krishna used to administer his kingdom while, he chose to live with his family in Bet Dwarka.